A new, international partnership between Syracuse University’s S.I. Newhouse School of Public Communications and HootSuite will help prepare students for the digital and social media jobs of the future. This is the first-ever higher education partnership for the Canadian company, which now boasts some 3 million users. Under the direction of William J. Ward, social media professor at the Newhouse School, students will have a free subscription to HootSuite Pro and receive the same training—including video-based lessons, case studies and testing—as professional subscribers to HootSuite University. 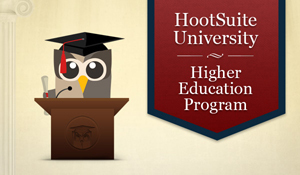 Using HootSuite, students will learn to manage multiple social networks, such as Twitter, Facebook, Google+ and LinkedIn. “Students use social media to connect with friends and family, but they need hands-on experience with the professional social media skills demanded by the industry today,” says Ward. According to a report from Monster.com in late 2010, social media job listings had increased 75 percent from the previous year, with more than 10,000 jobs a month requiring digital and social media skills. Yet a Manpower Group study shows that more than 52 percent of companies are having difficulty filling these positions due to a lack of “hard” technical skills among candidates. At the same time, keeping up with the rapid pace of change and innovation in social media is a continuous challenge; last year, there were more than 30 updates to the major social media platforms (Twitter, Facebook, LinkedIn, Google+ and YouTube). For more information, contact Ward at 315-443-9245 or dr4ward@syr.edu. You can find him on Twitter at @DR4WARD.